Our team is working on developing augmented reality (AR) applications for aerospace industry. 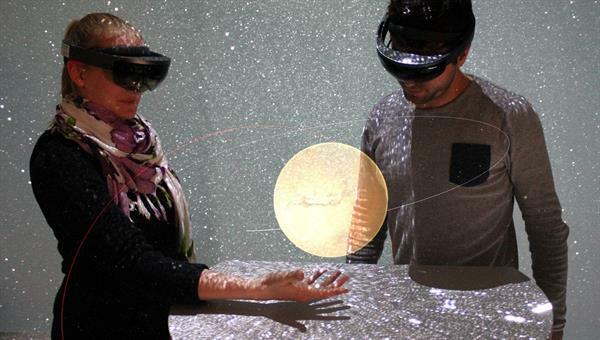 Hand controllers with external tracking systems are being used to facilitate hand manipulation of 3D virtual objects visualized through the AR glasses. Therefore, low latency network communication between the controller system and the AR glasses is needed. Existing communication techniques are often helpful but they do not guarantee highly frequency data transfer. The purpose of this thesis is to find out the serialization and data transfer techniques that would communicate the controller interaction information from a PC to/from the AR glasses with minimum latency. In the end, the communication techniques and the benchmark performance results have to be reported in the written thesis. It's not all about exciting research projects: we encourage a healthy balance between work and leisure.